We had a wonderful time last Saturday, celebrating 150 years of Elkdom at our Alameda Elks 150th Gala celebration. Attendees began with a champagne cocktail hour, and then enjoyed Lobster and Beef Dinners, before dancing to the Big Band sounds of Lavay Smith and her Red Hot Skillet Lickers. 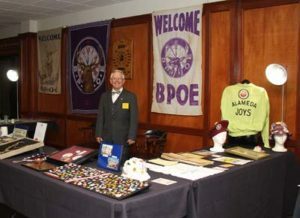 Special thanks to Chris Cormier for assembling and manning our Elks History and Memorabilia exhibit! Thanks to the 150th Anniversary Committee for a memorable event! You can see some pictures of the event in the album below. If you would like to view many more photos and maybe purchase photographs, please visit the web site of our event photographer, Clayton Mitchell at the following link.